The Cobra Traveler... three piece Kayak is no longer in production. Used Travelers are sometimesavailable used, but they are becoming difficult to find. Call or e mail for availability. 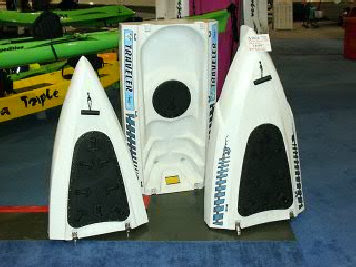 The Cobra 3 piece Traveler Kayak is a totally unique, transportable, open deck kayak. You can send this 11ft 7" lightweight craft anywhere in the world via U.P.S. Each of the three sections weigh only 15 pounds or less. It takes only minutes toassemble the individual parts into one solid kayak. You can even take it aboard an airline as luggage at no additional cost. Each hull section has a storage hatch, so you can use it like a suitcase and check it in just as you would any individual piece of luggage. You can put this kayak (in) your car instead of on top of your roof. You have to try it to believe it! Stop by our store anytime to test paddle the Traveler for free. You cannot tell that you are in a three piece kayak when you are paddling, even in surf conditions. 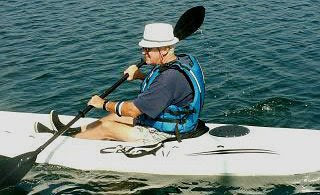 When assembled, the Traveler hull is the same as the popular Cobra XL kayak. Each of the three hull sections are completely sealed like seperate, individual kayaks. The connecting latches are made from high quality marine stainless steel. The hull sections are made of roto-molded polyethylene. Q- How do the modules of the T/A Traveler connect together?A- The Traveler connects with heavy duty hinges on the bottom and adjustable stainless steel locking mechanisms on the deck. There is nothing else quite like the Traveler on the market today. If you own a motor home, plane or boat, the Traveler is the ultimate take along kayak. You can even take the Traveler along with you on Ferry trips to Catalina Island and vacations to Hawaii or the Carribean!The Traveler is no longer in production. We only occasionally have used Travelers that we get on trade.